Brian Rike, a 6-foot-2, 200-pound junior, leads Louisiana Tech's murderers' row with 19 home runs in 43 games and is batting .350 with a .779 slugging percentage and 58 runs batted in. Even Brian Rike figured he'd be just another heavy hitter amid Louisiana Tech's murderers' row -- a lineup of .300 hitters that averages more than a home run per game this season. He's as surprised as anybody else with his ascent to Pitcher Enemy No. 1. "Definitely," the 6-foot-2, 200-pound Rike said. "Coming into this year I figured I'd be a little stronger. I guess I added some power." The Louisiana Tech junior outfielder has hit 19 home runs (second in the nation) headed into the weekend series against Hawaii at Les Murakami Stadium. In 43 games, he's batting .350 with a .779 slugging percentage and 58 RBIs. As a sophomore last year, Rike totaled eight homers. Not bad for a walk-on who batted .152 as a freshman. "It's been a slow process for him, but he's improved all three years," Bulldogs coach Wade Simoneaux said. "Last summer he hit .392 with a wooden bat and he's a different animal this year." Louisiana Tech was the only Division I school that was even interested in allowing him to walk on after high school. "A bunch of Texas JCs wanted me, but this was the only D-I chance I had," said Rike, who is from Richmond, Texas. "I tried to make the best of it." Pitchers who try to make the best of it by not letting Rike hit create other problems for themselves. 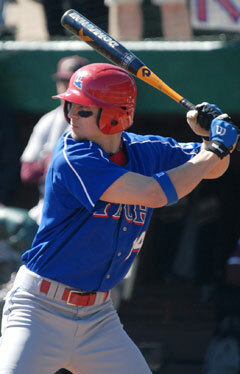 He also leads the Bulldogs with 15 steals in 16 tries and is first with 62 runs scored from the cleanup spot. "It's kind of nice. If people nit-pick and pitch around me, I can steal a base and make them pay for it," said Rike, who has walked 30 times and struck out just 20. Add in 12 times hit by pitch, and Rike is on base at a .474 clip. He's a big reason the Bulldogs are 29-14 and lead the Western Athletic Conference at 9-3. UH entered tonight's first game of three at 25-15 and 6-6. Louisiana Tech comes off a three-game sweep at Sacramento State last week, and it made sense for the Bulldogs to fly straight to Hawaii on Monday rather than return to Ruston, La., and criss-cross the country. "If we had to play Tuesday, we would've been real sluggish," Simoneaux said. "This gives us a good chance to get our feet under us, especially with the artificial turf." Rike said the biggest adjustment is defensively in the outfield. "We've only played at one other artificial turf field, Northwestern (Louisiana). And that was just the infield. The outfield was grass," he said. "On this turf, the ball really moves fast and gets to the wall fast, so you have to take different angles." Simoneaux said the Bulldogs' 55 homers are more a function of playing in bandboxes than anything else, and that his hitters will go shopping at the gaps this weekend. "We're not really a home run hitting team. The ball really flies at our park. We're going to stick to what we do, of course. Hopefully, the balls will go for doubles and triples," he said. LaTech's team ERA is 4.54 compared to Hawaii's 3.34. "You make a mental mistake up (at Ruston's J.C. Love Field) and you pay immediately. Here you can get away with some. At our place, every mistake will cost you. Our motto at home is to outscore our opponents," Simoneaux said.